I was always a big fan of Galaga as a kid. I had great memories growing up playing it in the local arcade. When I first found that I could play it on the computer with MAME, I though it was great. Although I wasn't really interested in building an actual cabinet until the day I realized that you could play Galaga with a regular PC monitor rotated in a vertical orientation. The day I realized this I was hooked and had to build a cabinet. While many people build MAME Cabinets that are capable of playing every single game out there, I had a different goal. 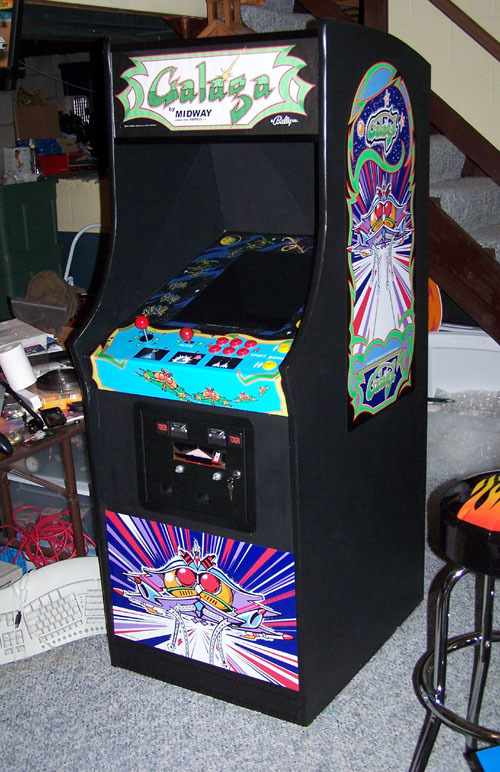 I wanted to build a cabinet that both looked and felt like a Galaga but yet was capable of playing a large amount of games, mainly the ones I was interested in. I came up with several versions of my control panel layout over about a six month period. And finally settled on a control panel that had a Galaga control panel build into a more funtional CP and still retained the overall look of Galaga. My CP has two joysticks, a 4-way/8-way and a separate 2-way. It also has a classic six button street fighter button layout with player 1 and player 2 buttons. The 2-way joystick is from an actual Galaga CP. The distance between the 2-way and the last fire button is the same distance between the joystick and fire button on a real Galaga CP (see Control Panel link at left for an example). So this setup still maintains the feel of a true Galaga. But the 4-way/8-way joystick allows me to play many other games as well. I also have a wireless game pad for games that require two players at the same time.